As already mentioned multiple times the context of an IS matters. As my research takes place within Ethiopia, which definitely is a developing country, it make sense to find some challenges commonly met in developing counties when implementing an IS. Developing countries are very diverse, so I will have to paint with a broad brush here. Challenges meeting developing countries are many, but I will focus on challenges in connection with ICT and IS. In this section I will first explain the importance of social informatics and cultural understanding when working with ICT in developing countries, then I will focus on the worthy goals of increasing democracy and empowering the marginalised through ICT. After that I will review some literature about the digital divide. Last I will review literature about the transfer or translation of western technology into the different contexts in the developing world. Walsham (2001) argues that social systems methodologies that emphasises the importance of the organisational, cultural, social and political context are highly suitable for developing countries. Culture are often portrayed as constraining, inhibiting the effective use of technology, by western analysts. This perception is marked by heavy cultural bias. This does not mean that we should naively accept all aspects of a culture, but we should think twice before labeling aspects of a culture as limiting. Perhaps the technology is inappropriate, not the culture. Most of the worlds ISs are made for western markets. From ST we can say that this ISs seeks to support social practices common in the western world. Walsham emphasises the importance of obtaining deep understanding of the local culture when working with ICT in a particular context. A lot of understanding can be obtained by reading extensively about a particular region or country, but to really understand the subtleties of a culture and its social rules you have to immerse yourself in the culture. There are various way in which cultural understanding can be developed, not least by living in a particular country, and thus being immersed in the culture. . . . An expatriate manager of a multinational company, staying at a five-star hotel, may be physically present in a particular country, but may have little access to or interest in local culture. Understanding through immersion require a starting point of respect for local cultural values, and considerable effort to understand these. Braa (1997) argues why social systems methodologies are even more appropriate in the developing world than in the developed world. The social systems in the developing world tend to be more fleeting and informal. Stable structures are easier to formalise, and developing countries tend to have more unstable structures. As mentioned earlier, the more stable a structure is the better candidate for an ICT it is. Within developing countries development can be at very different stages, with substantial differences between different regions and between urban and rural areas. Braa argues that the Scandinavian participatory approach to system development can also be useful in developing countries. The Scandinavian approach focus on the local scale, process, empowerment and mutual learning. A typical scenario in developing countries “40 people, 20 units and 1 computer”. This makes ISs into predominantly social systems, with some computerised support. With few computers and little ICT experience the need for support/training is important and will have to be established during the development process. IS development in developing countries need to be rooted in the local social system and driven from within. To attain sustainability a process which leads to empowerment and a sense of ownership towards the IS have to be cultivated. Kimaro and Titlestad (2005) introduces the concept of participatory customisation. It is within the same tradition as PD, but shifts the focus from designing a system from scratch into adapting a preexisting system to a local context. Users, that are not computer savvy, should be able to make basic changes. Customisation means that the intended users change the system design in order to reflect their work practices and needs. The design of an already existing system is customised with user participation where intended users, not necessarily with high technological skills, are initially trained to be able to participate. Because of limited resources in developing countries it makes sense to adapt an already existing system, rather than building from scratch. This approach have challenges similar to other participatory approaches, like motivating and selecting the right participants, but it is even more important that the participants develop basic computer skills. A customisable system should have the ability to easily implement visible changes. If the digital divide is not bridged it is believed that marginalised groups might become even more marginalised. ICT gives those with the ability to effectively use the technology an advantage compared tho those who are not able to effectively use ICT. A popular label for the time we live in is the information age and ICT gives access to a vast body of information, through the Internet for the most part. The C in ICT is also important through technologies like the Internet and to a lesser extent through conventional communication technologies like a telephone (fixed or mobile), you can communicate with people all over the world. You can promote your views and explore information about subjects that interests you, or you can sell handicraft or buy a digital camera. In other words you can participate in an emerging virtual marked and a global virtual community. The hope is that the bridging of the digital divide will improve social and economic equality, academic advancement and self improvement, economic growth and democracy3. The capacity and opportunity to successfully integrate ICTs into the accomplishment of self or collaboratively identified goals. Warschauer (2002) gives three case examples where efforts at improving peoples life through ICT had disappointing results due to the lack of consideration of the socio-technical context of the case sites. This three cases too narrowly focused on providing hardware and software. 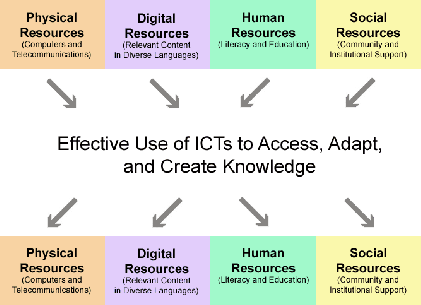 Warschauer have categorised the resources needed to make effective use of ICT into four categories illustrated in Figure 2.3. This resources have an iterative relationship with ICT which can lead to an upward or downward spiral to the effective use of ICT. The organisation Bridges which is a leading Non-Governmental Organisation (NGO) in the application of ICTs to economic and social development, links effective use to the term e-readiness4. With the specter of the growing digital divide looming large, world leaders in government, business, and civil society organizations are harnessing the power of information and communications technology (ICT) for development. They seek to improve their countries’ and communities’ e-readiness – the ability for a region to benefit from information and communications technology. It is increasingly clear that for a country to put ICT to effective use, it must be ’e-ready’ in terms of infrastructure, the accessibility of ICT to the population at large, and the effect of the legal and regulatory framework on ICT use. If the digital divide is going to be narrowed, all of these issues must be addressed in a coherent, achievable strategy that is tailored to meet the local needs of particular countries. In order to bridge the digital divide technology has to be “transferred” one way or the other. The developed countries are driving technological innovation while the developing countries are falling behind. The process of transferring the technological artifacts and “know how” from the developed to the developing world are frequently labeled technology transfer. Different perspectives have been used to understand the technology transfer process. Nhampossa (2006) discusses three perspectives; diffusion, transfer channels and transfer life-cycle. The diffusion perspective argues that the adoption of technology tend to follow a S-shaped curve. This perspective give a prominent position to the individual adopter, and do not take the social system where the diffusion takes place into account. The transfer channels perspective describes technology transfer as being facilitated through channels like sale of technical artifacts, foreign investments and education. This explains technology transfer as a one way sequential process, and it suggest that the success or failure of ICT project can be explained by the effectiveness of the different channels. For the third perspective, the technology life-cycle perspective, I will give a more detailed explanation. The technological requirements are identified and the different alternatives for new technology are surveyed. Based on these assessments the appropriate technology are chosen. The chosen technology are purchased and installed. This often include some training and consultancy to assist in the installation. Assimilation and use. The goal of this phase is to ensure that the people who work with the technology understand how the technology works, how to use it and how to maintain it. Depending on the technology and the planned use of it there might be a need for adapting the technology. For context sensitive technology, which ISs most often are, this is a fundamental part of the project. For ICT specific projects this phase helps to build local ICT capabilities. When the recipients master the technology they can transfer the technology to other organisations and make innovative changes to the technology, or even make new technologies. Technology are treated as “black box”. Technology is seen at a superficial level, with to little emphasis on the technical specifics. Technology transfer is seen as a one way sequential process. Technology is created in developed countries and transferred to developing countries to help them “catch up”. This view tend to disregard the political brokering and negotiation needed to make things happen. The intra-organisational conditions are not taken sufficiently into consideration. The diffusion perspective sees individuals as de-linked from the socio-technical context and fails to recognise the technological learning which may result from the transfer process. The technology transfer process is seen as one giant step from developed to developing countries rather than series of incremental and interconnected steps. Technology developed in the west are often inscribed with western assumptions of rationality. This technologies cannot be replicated, but have to be translated. Technology created in developed countries are designed for social systems quite different from the realities in developing countries. For strongly context sensitive technologies like health information systems this poses real problems. Heeks (2002) calls this design mismatch a design-reality gap, and use this to explain why most ISs in developing countries fail either totally or partially. The technology translation perspective is seen as the process of cultivating sustainable networks. For a technology translation process to be successful the technology and the surrounding network must have the capacity to endure over time and space, in other words be sustainable. Technologies or systems become sustainable if they are institutionalized in the sense of being integrated into the everyday routine of the user organization. However, sustainable technology or systems need not only be institutionalized, but also need to be flexible in order to allow for changes as the user needs them. Nhampossa defines technology transfer as a process defined by three point. The initiative should be designed as an incremental and context sensitive process, carried out in rather small steps. Translation represents an iterative and evolving long term process, having implications for both sustenance and scale issues. Technology translation includes building and supporting heterogeneous socio-technical networks and ensuring indigenous capacity building. A key characteristic of this definition, Nhampossa argues, is the need to balance flexibility and stability. Sustainable systems must be institutionalised and at the same time remain flexible enough to accommodate changes occurring over time and space. Relating to ST this need for balancing stability and flexibility can be expressed as stabilising social systems, but at the same time be able to adapt to changes in the social practices. ICTs are best suited for stabilised social systems, but the social systems in developing countries tend to be more unstable. This lead me into thinking that the process of technology translation involves making the social system more stable and at the same time making the ICT more flexible. 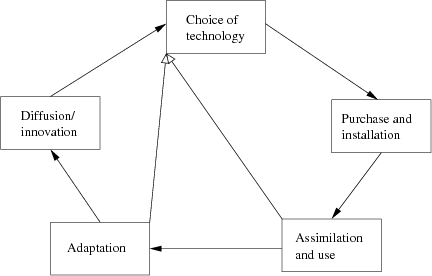 Nhampossa (2006) further identifies four key influences that are influencing and influenced by the process of technology translation. Organisations frequently have legacy systems which are based on outdated technologies. This systems often have high business value because they have important business rules inscribed into them, and is an important part of the current social practices within the organisation. This systems can be expensive to maintain and have high inertia, so it is important to identify which legacy system that need to be changed and how to build upon and incorporate the legacy system into a strategy for change. In other words there is a need to cultivate the installed base. Depending on how context sensitive the ICT is there might be a need for making changes to the software, both configuration changes and changes to the code. Therefore it is important to identify the context free and context dependent technologies, and which part of a program that is context free and context dependent. The importance of participation I have already described in section 2.2. Here internationalisation refers to the process of isolating the culturally specific elements of the software. Localisation refers to the process of infusing cultural or business specific elements into an already internationalised program. The balance between stability and flexibility need to be cultivated. To cultivate this balance generic functionality and changeable functionality must be identified. 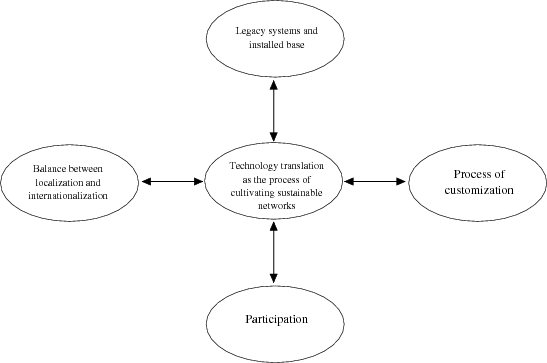 The theoretical framework for technology translation is summed up in Figure 2.5.